Epson "cartridge-less" ink printer line. Is it a money saver or not? - National Cartridge Co.
1Based on average monthly document print volumes of about 150 pages (ET-2700, ET-2750), 300 pages (ET-3700, ET-3750, ET-4750, ET-7700, ET-7750, ET-16500), 450 pages (ET-8700), and 800 pages (WF-R4640). 2Included ink bottle yields based on the ISO/IEC 24712 pattern with Epson’s methodology. Included ink bottle (Starter Bottles) photo yields are significantly lower. WF-R4640 included ink pack yields are estimated based on ISO/IEC 24711 test in Default Mode printing continuously. Actual ink yields will vary considerably for reasons including images printed, print settings, temperature and humidity. Yields may be lower when printing infrequently or predominantly with one ink color. All ink colors are used for printing and printer maintenance, and all colors must be available for printing. 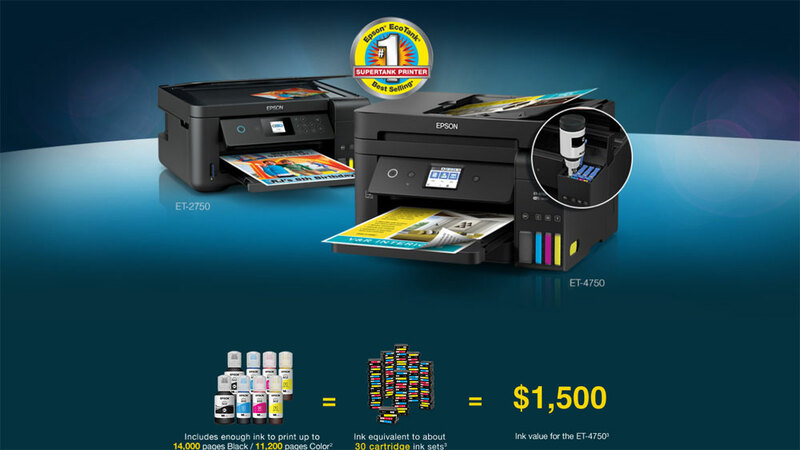 For more information, visit www.epson.com/inkinfo. 3Equivalent cartridge sets estimate based on print yields of the included Black and color ink bottles as compared to Epson standard-capacity ink cartridge sets for similarly featured cartridge printers as of March 2017. Ink value based on MSRP (USD) of equivalent cartridge sets. 4Savings comparison based on the purchase cost of replacement ink bottles and the cost of enough cartridges to achieve the total page yields of the bottles using the manufacturers’ online prices and yields for the highest-capacity cartridges for the best-selling, similarly featured consumer inkjet printers priced at $499 or less per NPD, July 2016. Actual savings will vary based on print tasks, print volumes and usage conditions. First of all, we need to separate some of the elusive facts from the obvious fictions stemming from this advertisement piece. Cost per page is not determined here. CPP is the way you measure true cost of operating any printing machine. Yet Epson conducts a study, comparing the usage and yield of the ink tank system, with the old way of swapping out little ink cartridges. It’s like comparing Samson to Goliath. Yeah, we all get it. Ink Tanks hold a lot more ink than a print cartridge. Somehow, Epson has taken the print head of the cartridge and married it to the machine. But I already know from years of playing around with ink cartridges, that the print head is what burns out, warps, bleeds or smears the ink at or near the point where the cartridge runs out. At least with a ink cartridge, you get a new print head — the electronically vibrating component that jets the ink out in a precise way. But cost per page is simply the price of the cartridge, or in the ink tank, divided by its yield or total pages it prints. That would give us a cost per page, in terms of pennies per page. 80% savings is the promise to the consumer. But is Epson deliberately stabbing itself in the foot? Epson makes its lion share of revenue by selling ink cartridges. Now that Epson is advertising a better offer to the smart consumer who is already mindful of ink costs (and therefore making the buying decision for an office printer upon ink cost), Epson heads off the buyer with the seemingly attractive 80% cost saving figure, to win them over. Again, I turn back to the Cost per Page. Is it really 80%? Are there other costs that are not related purely to ink tank replacement, but perhaps a print head replacement or something else that could be replaceable as a consumable? There are a lot of printing habits that vary the overall yield that the ink tank system will deliver upon. They’re mentioned above, but I did not see the obvious: page coverage. Epson assumes that people print predictably the same content over the same page coverage, and so yield cannot be promised with any certainty by Epson, and I would not expect them to make such promise. Percentage wise, we look at each person’s printing habits and draw a yield comparison relative to each type of printing system. Perhaps Epson is trying to tap into the higher volume printing going out there, to take some of the marketshare away from the laser printing users, and get some roll back to inkjet printing. Either way, it’s about cost per page; the absolute measure of what you spend to get a printed document thru the machine.